Once you decide to set-up a real-estate business, all you need to do is select the right business products. While it is a bit difficult to start with the real-estate venture, you can always make it better with your own real-estate website. If you are a real estate agent who wants to sell a big new house, for example, you ought to display a large photograph on the front page for real look of that house. You can do that in WordPress by selecting a unique theme designed for realtors. Then you can also include thumbnails on the side for easier navigation so that your buyers can find other available properties too. 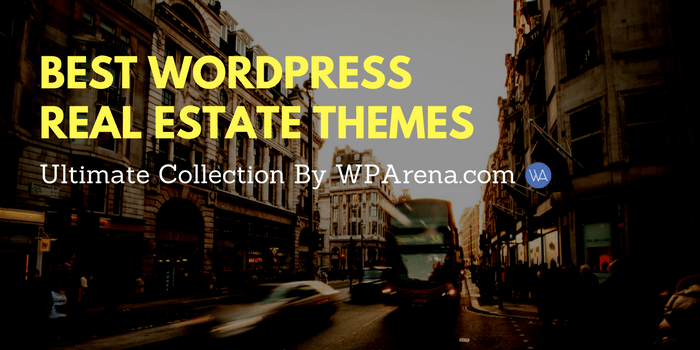 And, one of the most important things on your WordPress website is the theme. 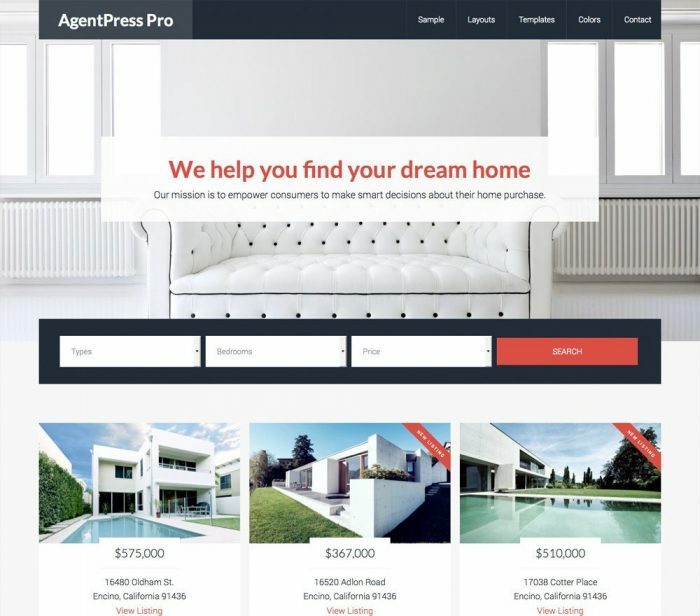 Here are some of the most amazing WordPress real estate themes for realtors, developers, and property dealers. Real homes is a high-quality handcrafted theme designed for real-estate business. Easy search and google maps are present. It has additional features which are also the reason behind being popular out there. It has customized searches for the property searchers. Cross-browser compatibility is there too. AgentPress is far most No.1 WordPress property theme due to its speed, SEO, and robust framework. The theme is built on World famous Genesis framework, and there is no competitor of it in security and features. If you know simple hooks and actions, you can easily modify any part of the theme and the look. BaseGround is a specialist theme for individuals, businesses, and companies in the construction industry. The theme can arrange the architectural portfolio within one website. Pre-built templates for web pages, options for sliders, widgets, and display settings are only some of the features of the theme. Professionals have designed the theme to allows users to customize their sites. Spotter is a global directory listing WordPress theme. It goes handily with real-estate sites, car dealership businesses and even restaurants! It has highly supportive google maps with fresh, modern design suit. It has unique templates for ensuring content representation. The 1170px bootstrap design provides the ultra-clear layout and responsiveness. This theme is integrated with different membership payments methods including PayPal, and Stipe. The latest visual composer is something you cannot overlook. Frontend and backend interfaces include directory and listings. You can edit, re-create tariff plans for your site. Pages are retina ready and attractive. Also, supportive WPML cannot be overlooked. Solus is a single property WordPress theme that is both easy to use and feature-full. Unlimited color schemas help better customize your real-estate site from a front-end. It includes a high-resolution display for the interactive user interface. The layout is again, responsive and clean. You can use it for your global clients, as it is translation ready to put-on any language. Coding is specifically optimized for faster theme performance. 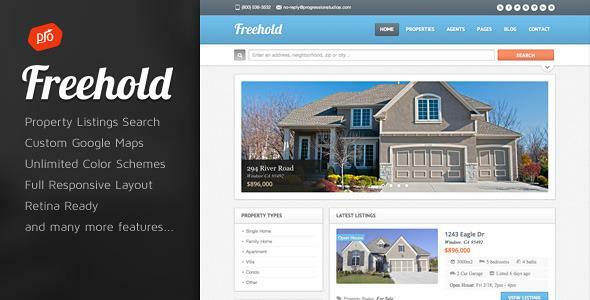 Freehold is a multiple listing property themes. It includes beginner level customizing options and highly-responsive layout. This retina ready real-estate theme has custom google maps integrated in addition to multiple-color-schemas. Highly advanced real-estate theme and unlimited property images will always boost your client conversion. Multiple real estate custom widgets are present. 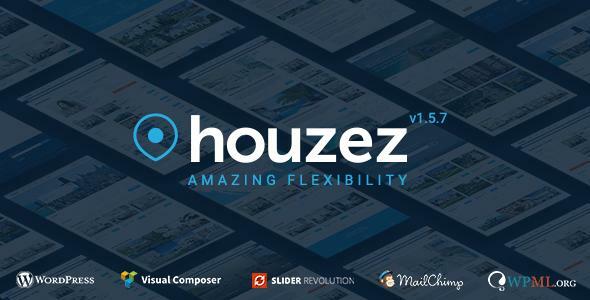 Houzez is another most selling, popular theme with a sleek design. You can showcase luxurious home and villas to your clients, in fun and interactive way. It has ultra-advanced filters for customized searches. Multiple robust layouts would change your whole real-estate-business game! Documentation and support are excellent as well. Professional theme customization makes Houzez way better. Different listing options and spacious ad banners convert more customers. Geolocations search, payments gateways and what not! Beyot is an excellent real-estate theme with a premium design for effective showcasing. It has front-end integration for providing the ease of property integration to real-estate agencies and independent agents. It gives multiple options for including property listing- Free or paid. Beyot has 8+ homepage demos and RTL support making it more dynamic. Payment methods integrated are Stripe, PayPal and Wire transfer. Cross-browser compatibility and MailChimp integration makes it the best WordPress-real-estate theme. Another beautiful WordPress theme in our list is Madrid. This real-estate theme is designed to impress. The homepage layout is easy to customize and crisp. Customization is effortless; you can quickly change elements. Additionally, you can also get into the CSS as the theme has Bootstrap. Listing queries template is attractive and clean. It is specifically optimized for search engine and faster performance. Oslo is a real-estate theme with 100% responsive layout. There are different templates for property listing that would both improve the conversion rate and help attract more clients. You can also boost the functionality with premium add-ons. Oikia has a highly-unique layout with new templates. 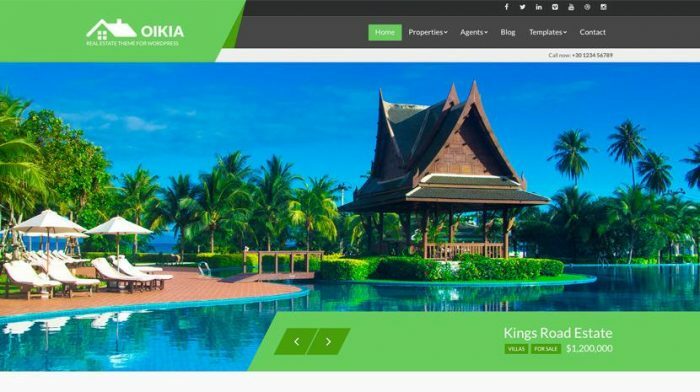 This real-estate theme has custom widgets and great color schema for recreating, editing your site design. Great range of page builder compatibility and SEO ready pages. Also, there is an eye-catchy design that helps to showcase properties in a better way. Gapura is a single property WordPress theme with multiple page templates for real-estate companies, independent selling and so forth. It helps to showcase luxurious houses, land and villas cleanly. Unlimited color and retina-ready display help improve homepage site look. Customization is something you won’t have to worry about. Avlar is a premium real-estate theme for multiple listings. It has front-end listing feature to make the posting smooth and easier. The favorite-property-bookmarking feature helps clients/visitor to funnel out their choices quickly. Cross-browser compatibility is present, and templates have higher resolution as compared to the regular themes. Powerful page builders and actionable SEO coding will certainly help improve your real-estate business. London is an elegant theme and one of the most popular themes by WPCasa. Customization is easy, and widgets are spacious. To improve user experience, they have embedded powerful header settings. London’s pages are beautiful and clean. This fresh theme is SEO-ready and has eye-catchy elements for more visitors. Mercantile is multi-purpose WordPress theme high-quality code elements for providing swift accessibility to your visitors. While it was created for corporate, agency and real-estate related websites, you can use it for portfolios and personal blogs as well. One page menu and advanced logo options always help improve conversion. This is a simplistic WordPress theme with impressive page templates. This real estate theme has strong features for better-showcasing property info including agent details, Google mapping and so forth. It is WPML supportive which helps in better global representation. SEO-ready templates and PayPal support is something you could never overlook in a theme. 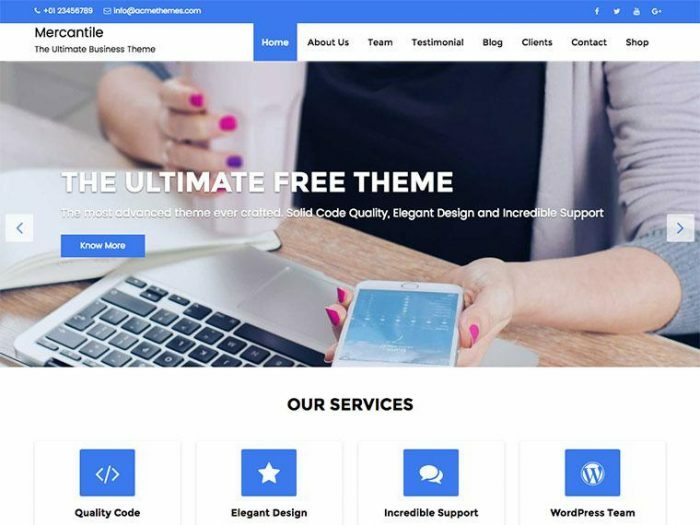 With powerful admin tools and responsive Website design, this theme could change you real-estate-website-game! 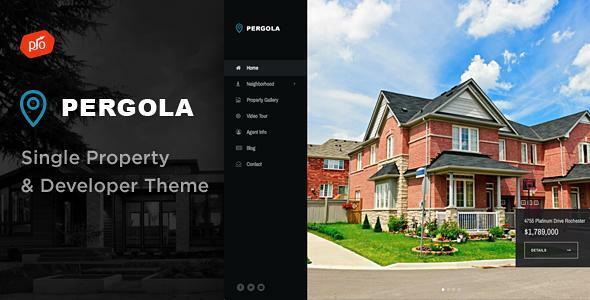 Pergola is a robust single property theme that provides high-quality and well-designed pages. Google maps and Image galleries are present. Drag and drop builder is more actionable than regular ones. This responsive theme is translation ready and provides retina support for effectively displaying the real-estate properties. RE7 is a highly updated real estate theme. This theme has listing options for showcasing properties. There is a listing statistics feature to help the visitor track a particular. With powerful customization and highly advanced mapping, this theme already became popular out there. WPML and RTL support is present. This responsive theme is one of the most amazing real-estate themes that will surely boost your property sales. Luxor is a high-quality real-estate theme. This WordPress theme is highly responsive and includes WPML support. Redux framework and high-quality property gallery that actively helps promote properties. WooCommerce compatibility and visual composer makes luxor a great fit for all types of real-estate website. Reales is an excellent WordPress theme with the fully-responsive layout and autocompletes search box. The front end and Google maps are there. It is fully-responsive and compatible with WPML. With Bootstrap framework editing is possible. This retina ready theme has everything you need for a fantastic real estate site from agent ratings to customized property themes. Zoner is another theme in our list that fits perfect with agencies, personal real-estate, and related business websites. It has google map and street map support embedded with clean mapping elements for better User Experience. UI is smooth and responsive. Zoner has over 14+ different homepage options and easy-to-customize templates. 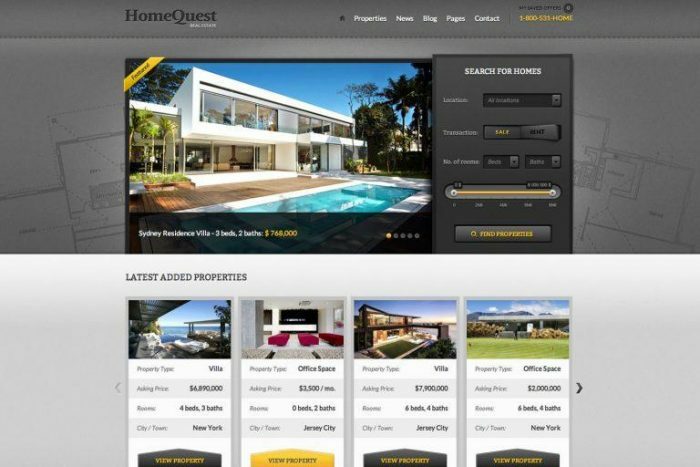 HomeQuest is a powerful WordPress theme that boosts client conversion rate. You can put up property details engagingly with unique, different pre-made styles. Made with RWD web design and high-quality elements helps the viewer with visual insights, and thus, with finding a suitable property. From the huge collection of WordPress Real Estate themes, it concludes that WordPress is not just a blogging platform but a complete CMS Solution. One can build just anything using WordPress and can enjoy its community support and free resources. If you see any good theme missing from the list, please don’t forget to mention that in the comments section below. We are regularly updating this Real Estate Themes list and will be continuously improving it. Previous Post Why Should your WordPress Business have an Affiliate Disclosure page?